Maybe you've heard...? There's a special election going on today in Massachusetts. 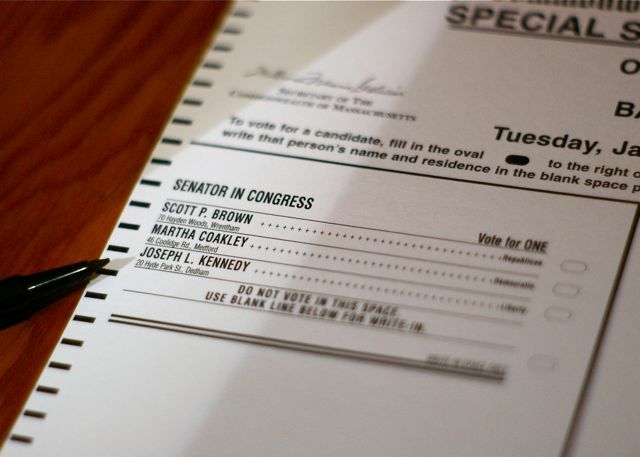 It appears to be a very close race to fill the late Ted Kennedy's Senate seat. I have never seen such campaign craziness in my life. If we got one robo-call just today, we got ten. No exaggeration. So, in case you were going to call & remind me to vote, please don't bother. I did already. See? i almost executed a similar shot but was a bit rushed voting on my way to work. Did take a quick shot of the exterior of the polling place but went with a different photo for the day altogether. I'm surprised we didn't hear more about your heated race down here in Virginia!